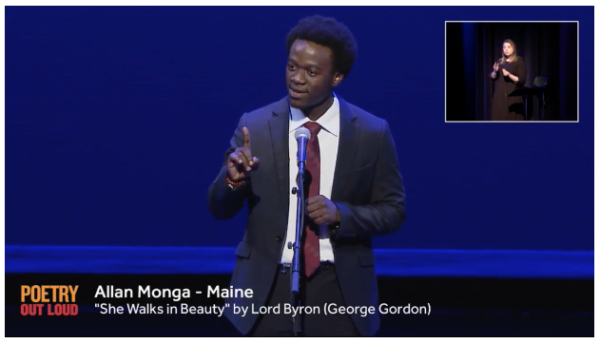 Allan Monga of Deering High School competes in the national Poetry Out Loud competition on Tuesday, April 24, 2018. A Westbrook teen who went to court last month for the right to participate in a national poetry competition competed in Washington D.C. Tuesday in the semifinals, but did not advance to the final round. Allan Monga, 19, recited “Song of the Smoke” by W.E.B. DuBois, and “She Walks In Beauty” by Lord Byron during the semifinal rounds in the national Poetry Out Loud contest. He was not chosen as one of the eight students who advanced to the semi-final round of the regional competition. Nine students will compete in the finals, to be held at 7 p.m. Wednesday in the Lisner Auditorium at George Washington University in Washington, D.C.
U.S. Rep. Chellie Pingree congratulated Monga in a press release issued Tuesday afternoon. Pingree, a Democrat who represents southern Maine, is scheduled to meet with Monga on Wednesday morning at her office in Washington, D.C.
Monga told the Press Herald he still plans to attend the finals before returning to Maine later in the week. He won the state Poetry Out Loud contest, sponsored in Maine by the Maine Arts Commission and nationally by the National Endowment for the Arts. The poetry recital contest rules require participants at the state and national levels to be citizens of the U.S. or permanent resident aliens. U.S. District Judge John Woodcock said in his 39-page order that Monga would be harmed by being excluded from this one-time opportunity to compete on a national level. The judge left open the possibility that with more time for legal briefs and arguments, he might not order the NEA to change its rules going forward. The case is expected to go forward but no dates for filings or hearings have been set. Last month, the Maine Arts Commission ignored the citizenship eligibility rule and allowed Monga to compete, according to court filings. The commission also did not replace Monga with the runner-up as the NEA instructed. The commission declined to comment on Monga’s showing Tuesday citing the pending litigation.